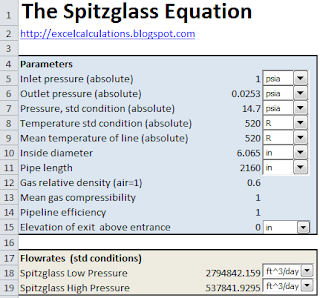 Originally published in 1912, the Spitzglass Equation is used for sizing fuel gas pipes (although now it is superseded by better correlations). Two versions of the equation exist; one for low pressures (below 1 psi or 6.9 kPa) and another for medium pressures (above 1 psi or 6.9 kPa). However, both equations are typically used at near-atmospheric conditions, with pipe diameters below 10 inches (otherwise the friction factor is not accurately modeled). This Excel spreadsheet solves both versions of the Spitzglass equations, with full units support. The notation is given here. These equations differ slightly to those versions typically presented in the literature because they include the effect of gas compressibility, and vertical pipe travel (i.e. potential energy). I've also implemented other equations for sizing gas pipelines, including the Weymouth Equation, Panhandle Equation and the IGT Distribution Equation.